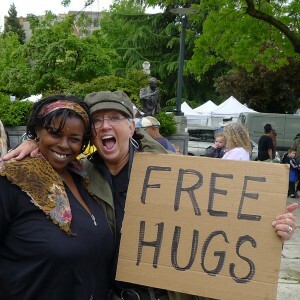 While I was was giving out FREE HUGS at our local Farmers Market, I met Besty. After a warm hug, she asked me if I was a member of the Happiness Sprinkling Project. I replied I had never heard of it before and had no idea what it was. She rummaged around in her bag and pulled out a small card, smaller than a business card that read in all caps, “YOU ARE ENOUGH.” Betsy then told me about this movement – how people gather together to sprinkle happiness on others – holding large signs, giving out small cards, waving, offering hugs…. How marvelous! More just like me, spreading a little love, a warm hug, a little happiness to anyone that will receive it. 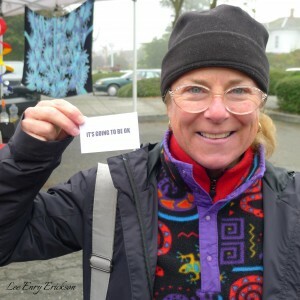 As I offered, I emailed Betsy this photo of her holding another card, this one saying “IT’S GOING TO BE OK.” In return, she emailed me back a lovely reply. I learned a little more about her, her mother and friends. We are connected. I hope to see Betsy again. For now, we have each other’s emails as a way to stay in touch. An outcome of hugging and talking with Betsy – I joined the Happiness Sprinkling Project and am now a Happiness Ambassador [note the sidebar graphic, which links to the website]. Another outcome of connecting with Betsy , was learning of the HSP event coming up this Friday. I am going to participate in celebrating the anniversary of the first Happiness Sprinkling last year in Washington, DC, by pass out life-affirming cards to unsuspecting people around our community – the hospital, nursing home, ferry terminal, cafes… wherever my feet shall take me. Others may join me. And of course, I will be offering FREE HUGS. Another outcome of meeting Betsy is connecting with the founder of the Happiness Sprinkling Project, Laura Lavigne. I invited Laura to be a guest blogger on my website to share her story, what led up to the MOMENT she decided to found the Happiness Sprinkling Project, and what has happened since she first launched the idea and inspired the first Happiness Sprinkling event – The Little Moment that Turned Big” Part I and Part II. Check out the Happiness Sprinkling Project and schedule a Happiness Sprinkling in your community! Yes, I AM ENOUGH…. and so are YOU! Come Sprinkle with us! This entry was posted in Moments, Personal Reflection, Perspective and tagged affirmation, community, connection, happiness, Happiness Sprinkling Project, hugs, Laura Lavigne.